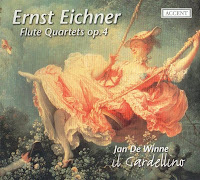 Ernst Eichner was a composer of the so-called Mannheim School who fell into obscurity as the Romantics discarded the light music of the Classical era, and whose music has until now been overlooked in the general late eighteenth century revival -- probably because the focus on music of the period has shifted from Mannheim to Vienna. But of course the influence of the Mannheim composers was continent-wide; Mozart's symphonies and keyboard sonatas from the late 1770s, for example, can't be understood without it. The chief musical attraction in Mannheim was the court orchestra maintained by the Elector of the Palatinate, outsized to match the Elector's mega-palace (at the end of World War II it was about the only thing standing). This set of six quartets for flute, violin, viola, and bass, composed in 1771, bears many traces of the Mannheim symphonic style; the melodies for the flute are chunky and a bit rudimentary, but they are nicely set off against very active arpeggio figures from the three strings. The music is high energy and upbeat, with hardly a slow movement present among the 12 on the disc -- each of the six quartets has only two movements.